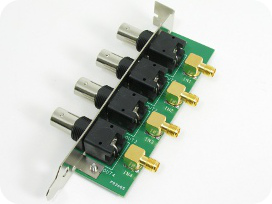 The SMA-BNC Adapter Board is an easy solution to provide access to four additional output signals from the back panel of your computer. For use with your PulseBlasterESR-PRO SP18A board, add two SMA-BNC Adapter Boards for accessing SMA flag bits 4 through 11. For use with your PulseBlasterESR-PRO SP4B board, add three SMA-BNC Adapter Boards for accessing IDC header flag bits 0 through 11. SMA-SMA or SMA-IDC cables are available upon request.